Soon you’ll be able to learn about upcoming local arts and cultural events while you’re visiting the weekly farmers’ market, The Old Monterey Market Place. The Old Monterey Foundation will have a stall each week at the Tuesday Farmers’ Market on Alvarado Street in downtown Monterey. Here you’ll be able to learn about the work that the Old Monterey Foundation does, upcoming arts and cultural events, and how to get involved. Our produce vendors come from all over California, from Salinas and Watsonville, to Fresno and Sacramento, selling Certified and Organic Certified produce. Arts and crafts vendors come from around the world, selling treasures from Africa, Colombia, Mexico, Russia, Japan, China, and Yugoslavia, just to name a few. Our food vendors also serve up delicacies that are as international as our products serving up Indian, Japanese, Korean, Mexican, Mediterranean, and BBQ delicacies. In our Baker’s Alley you can find fresh pastries like baklava, European breads, cookies, muffins, pies, and cakes. 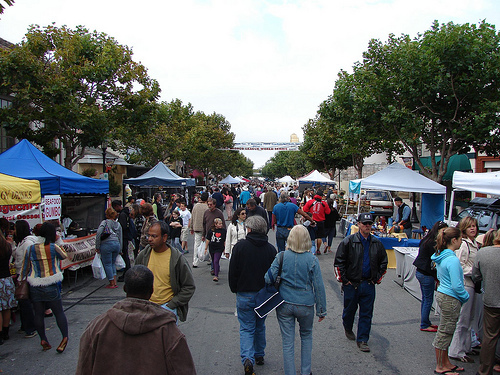 In addition to the products and food we offer, the Old Monterey Farmers Market also includes a variety of community events. You can donate blood through C.H.O.M.P., adopt a dog from the SPCA,register to vote, and enjoy live music from local musicians. During the holidays you can listen to carolers, as they’re dressed in costume straight out of a Dickens novel. While the Marketplace provides a plethora of food, produce, arts & crafts, and community services, it is most importantly a cultural focal point of Monterey. As the largest congregation of locals year round, the Farmer’s Market offers a place for people to visit friends, make new ones, catch up with acquaintances, and discuss current affairs.